Contact Backup. The new simple way to backup all your contacts. Perform quick backups with the touch of a button. 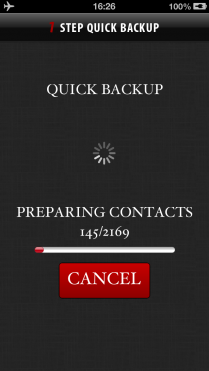 Most of the times you want to perform a complete backup of all your contacts without hassle. 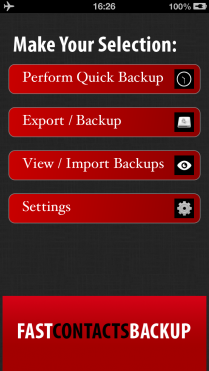 That is why our first main menu option is ‘Quick Backup’. You can set the file type (csv, vCard or PDF) from our ‘Quick Backup Setting’. Once you set it up then all quick backups will be performed with these settings. We offer 3 backup file types, so you can choose the one you prefer. We currently offer you the option to save the backup on the device, iCloud, your Dropbox account or email them anywhere. You can import contact from old backups. 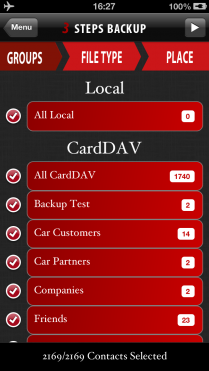 Currently only vCard import is supported. 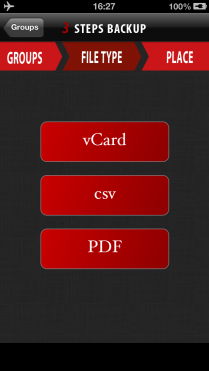 Your contacts will be exported in vCard format so you can import them later on your iPhone or most contact management systems. Saving your contacts on the device that holds them is not very wise. With Contacts Backup you can save your backups on iCloud and Dropbox. So in the unfortunate event that something happens to your device you can recover your contacts. Comma separated values. Using this format you can open your contact with excel, numbers or any other csv compatible software. Compared to most of our competition our csv file fields are dynamic. That means that no matter how many fields you have they will all be exported. For example if a contact has more than one mobile phone, field called mobile, mobile 1, mobile 2, mobile x, will be created. Most of the software currently available will only catch the first mobile phone. Our nice PDF export feature, create a PDF file with a list of all your contacts. This file is easy to read and print so you can keep a hard copy of you contacts. We offer a wide selection of PDF file setting. You can select if you want to include/exclude contact photos, creation/modification dates, notes, category header. You can even select if you want the pdf to have 1, 2 or 3 columns.